Church Magic Shows by Comedy Illusionist Amazing Jeffo, The Blind Magician! This unique program is an opportunity for all ages to witness the reality of God’s provision, plan and purpose for our lives. Amazing Jeffo uses a variety of entertaining methods to deliver an important message to engage congregations throughout the Midwest. Audiences are shown how God uses the powerless of the world to forever impact the lives of His people as they witness Amazing Jeffo seeing through the eyes of faith. All ages are engaged as they see flawless feats of illusion and sleights-of-hand performed by an illusionist with crooked fingers, the result of severe Rheumatoid Arthritis. Moreover, audiences laugh their socks off listening to scores of jokes and funny ad libs from this special illusionist who began his magic career with a chronic speech condition in the form of stuttering. Audiences are enlightened by not only what they hear but what they see as Jeffo helps them experience how we can do all things through Christ who strengthens us. As Jeff moves along the pathway of life, he is continually discovering God’s always surprising plan and purpose for him. "As I look back, I see how God has shaped circumstances that present to me new challenges and opportunities," says Smith. "Living by faith not by sight," is A verse used in his church shows. It illustrates that we all, in a sense, are blind to god’s truth until we trust in Jesus Christ. This is no less true for Jeff Smith, a.k.a. Amazing Jeffo. "I have found the greatest opportunities and blessings are presented to me when I take that first, scary step of faith and make my way through the challenge which then, opens a new door of opportunity". "I think one of the ways God helps me share His Gospel is by using my disabilities in a positive way. Since I naturally stand out from other, more typical, presenters, people might be more apt to sit up and listen because of their natural curiosity," says Smith. Through illusion, music and comedy Smith encourages people to trust in the Lord. This has also been an opportunity for Jeff to trust in God’s provision. "The nature of this business does not guarantee me a consistent or regular income. Therefore, since I love what I do, I need to be comfortable, at least most of the time, with the idea that I have bookings secured only about a month out. Yet, God has enabled me to pay the bills and continue doing this, now going on 18 years". Recognize that a disability does not define a child or family. Realize every child has purpose and significance. See humor even in challenging circumstances. "Parents desperately need encouragement that there child has a purpose and they, a hope for the future". Jeffo’s messages and approach are adaptable to all groups within the church body, including adult, pre-school, school-age, middle and high school. Initially the audience is in wonder about the illusion they are seeing and how it’s physically possible. Then their wonder is magnified when it dawns on them that their eyes are being tricked by someone without eyesight. Jan Carlson, Cross of Glory, Hopkins, MN, "Jeffo’s combination of humor and illusion was great. The spiritual content was great. You are a walking testimony of how God can use us if we let him, even with big obstacles like blindness. Thank you for your testimony - We were blessed!" Hundreds of churches over the last 15 years have experienced Amazing Jeffo’s performance which demonstrates how God’s strength is made perfect through our weakness. In spite of many physical challenges audiences are encouraged by Jeffo’s attitude and example of what can be overcome and experience victory through God’s grace. As Jeffo puts it, "He’s taken a person with so many physical deficits: blindness, arthritis, ulcers, high blood pressure, colitis, apnea, joint fusions, former chronic stuttering and debilitating shyness, combined with decades of childhood surgery and prolonged hospitalization. I’m awed by how God has taken me by the hand and placed me in an unimaginable position to share with others His work in my life." Sister Marion Fritz, Church of St. Richards Catholic, Richfield, MN, "You gave a faith-filled presentation in a very humorous manner that kept the children’s interest. Involving the audience was a plus. It was amazing to witness a person with a disability used the gift he has so well. Thank you for sharing your life and faith with us." Audiences are enlightened by not only what they hear but what they see as trick after trick illustrates how we can do all things through Christ who strengthens us. All ages are engaged as they see flawless feats of illusion and sleights-of-hand performed by an illusionist with crooked fingers, the result of severe Rheumatoid Arthritis. Moreover, audiences laugh their socks off listening to scores of jokes and funny ad libs from this special illusionist who began his magic career with a chronic speech condition in the form of stuttering, which miraculously disappeared after starting as the Amazing Jeffo. "I learned to rely more on God’s strength alone," says Jeffo. Jeffo’s warmth and openness, combined with a lighter style and gentle approach with volunteers, disarms and helps reinforce biblical truths which he weaves throughout the performance. His skill on the harmonica adds color and depth to the show, playing popular worship songs and favorite hymns. Jeffo’s inspiring message helps occasional attenders feel comfortable and more connected with the church. Susan Bonhiver, Camp Carmel, Calvary Lutheran, Golden Valley, MN, "Very funny - I haven’t laughed so much for a long time. Great tricks - lots of fun - involvement with kids in audience." If desired, a time for questions can also be scheduled at no additional fee following the performance. The question period is an opportunity to elaborate on applying the Christian concepts presented during the performance and offer perspective about using our spiritual eyes to see the presence of God. A variety of Christian growth messages are available and adaptable to all age groups within the church body including, adult, pre-school, school-age, middle and high school. Spiritual object lessons include dependence alone on God, the use of spiritual gifts, the danger of materialism, the effect of sin in believers, security of eternal life through Christ, seeing things through the eyes of faith, God’s plan for salvation, His plan and purpose for us, carrying your cross, the danger of universalism, and more. Any presentation can be tailored to a length and subject matter to fit your needs. Separate from the persona of Amazing Jeffo, Jeff Smith, is available to share his testimony of god’s work in his life. In an attention grabbing gospel presentation, Amazing Jeffo blends illusion with the message of salvation and living for the Lord. Amazing Jeffo is a living example of God’s strength made perfect through our weakness. America’s premier blind illusionist, Jeffo teaches living by faith not by sight. A lively, engaging, and light-hearted ministry for vacation bible school, community outreach, kickoff day, Sunday school, fund raising, and holiday events. II Cor. 4:18 - So we fix our eyes not on what is seen, but on what is unseen. 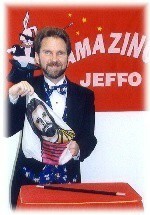 Pastor Greg Lenz of Christ Lutheran Church in Eden Prairie says "Jeff weaves a wonderful witness into amazing magic".